I tried lots of different products. All had sales tax applied. Out of curiosity I put the Avengers steelbook in my cart using zavvi.com and put in a California address and it's charging tax. @JCC Hopefully you contact Zavvi to find out if it's a glitch and get this resolved. Good luck! I contacted Zavvi but haven't gotten a response yet. Ugh, the greedy CA government is killing me. If any of you didn't manage to get a copy, it's also on amazon spain and amazon italy. 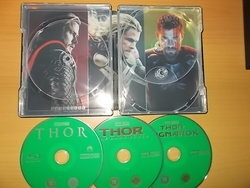 In Spain the price is same to Zavvi but in Italy it's 33€, same with Avengers trilogy. Iron Man and Captain America will be available again for this price. TBC maybe . . . true, the perspective of the hammer is a bit wonky . . . but hopefully just the hammer "Iconic Moments" style will be confirmed plus the darker colour to better match the others in this mini collection . . . hopefully confirmed embossed iconic image too as w/ Iron Man's mask, Cap. America's shield . 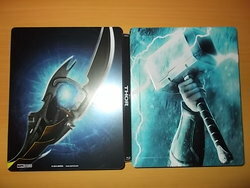 . . and the better smaller Avengers "A" symbol/logo on the, again TBC, steelbook from Italy. To match these two a nice pic of Thor on the back would also suit. Interested to see how these turned out. Thor Ragnarok is one of my fave films, so would always have that as a stand-alone steel so would never get this.